I have been thinking of this suggestion for a time now, and i wanna hear your opinion also. 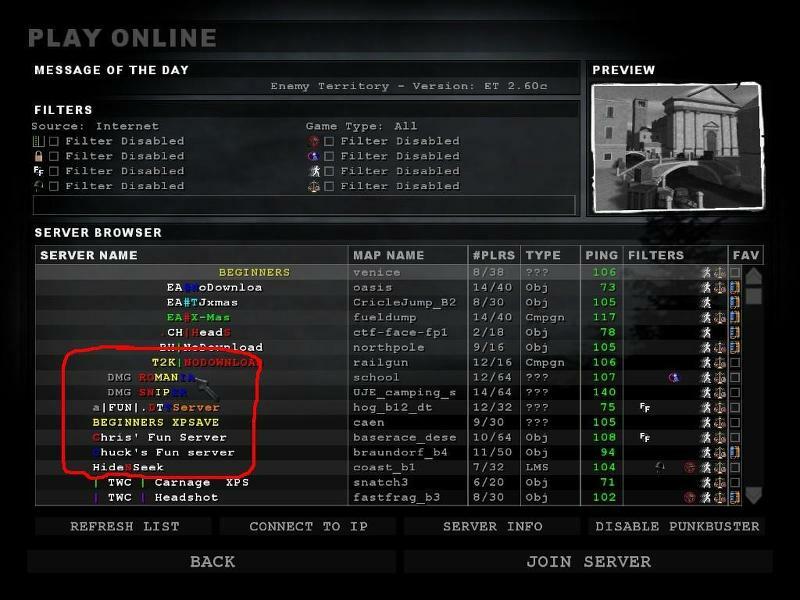 So, im suggesting, that we rename both servers like we used to have back in days. With lots of spaces in front of the servers name. Always when i open Wolf:ET server list, i hit once server name button, and servers will go in nice order. This is how i found G!X servers. We used to have G!X server little bit above TWC servers, and below EA servers. Somewhere in that red circle of pic above. "Why should we change the servers name?" I have noticed that servers up there, have more regular players, than servers on the bottom of the list. By adding our servers somewhere there, we could gather more and more regular players on both servers. And now, please leave your opinion. sounds good, support from my side! Good point Anttica , I usually click on "server name" twice at this point to find Blue, we seem to be at bottom of list, not even sure how I found G!X Blue in the first place....Oh I know as a Pubber I started sorting by ping but true, first going in to server list you grab what you see first when looking for a place to play. Good catch. When I start up ET sometimes it has suggestions for what servers to join. Kind of like F|A and different popular servers. Not sure how you get an add on ET, but I think we should do that. It happens mostly after I join a server and disconnect. Its like something I download. Some servers have custom login music aswell. Not a bad idea. Just a suggestion. Edit- Just started up ET now and RDA had one up there. You talking about a customized menu? Yup, have it done already. Tweaking it out some now sir. Subject: Re: General server suggestion.